A submersible exploration Ocean Infinity of America, hired by Argentina to help the search, discovered the object which was confirmed as the submarine ARA San Juan under the sea, 800m from the water surface. 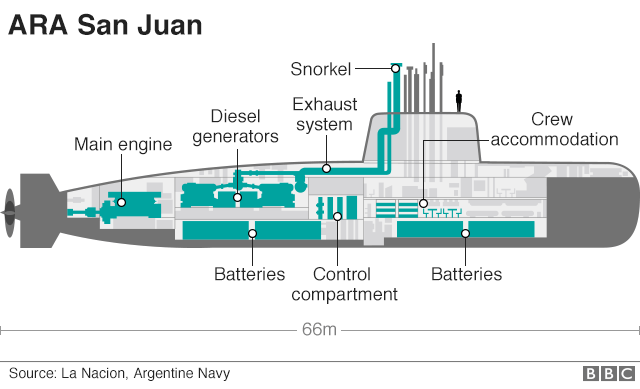 On 17/11 morning, the Argentine Navy claimed the submarine ARA San Juan missing last year’s has been found in the coast of the peninsula Valdes, located 800 metres from the sea surface, by a submersible exploration Ocean Infinity of America – the AP reported. The announcement was brought out 2 days after the families of 44 missing sailors and the ship holding a memorial ceremony one year since ARA San Juan disappeared. Currently, there is no information about the fate of the 44 sailors on board. According to ABC News, the soldiers’ families are still receiving their salary, because they still considered alive until found their body dead, or the government officially claims they were killed. Speaking at the ceremony, Argentine President Mauricio Macri said that the relatives of the sailors should not feel they are alone. He simultaneously pledged to find out “the truth”. After the submarine ARA San Juan missing in 11/2017, President of Macri confirmed the government will execute a thorough investigation. Argentina’s federal police examined the naval bases and many other Islamic buildings in January, after the head of the Navy was fired. On 15/11/2017, while returning to base in the city of Mar del Plata, the submarine ARA San Juan was carrying 44 crew lost contact signal. Argentina abandoned any hope of finding survivors after the rescue by 18 countries involved failed. However, the Argentine Navy continued to search for the wreck. The submarine ARA San Juan diesel-electric TR-1700 layer, invented by Germany, was commissioned in Argentina since 1985. The ship underwent a major overhaul process in 2008 and 2013. The Argentine Navy said that before missing, captain of the ship ARA San Juan reported on the status of water spilling into the shafts, causing a broken panels. But then the captain reported problems have been corrected. A few hours later, an explosion occurred at the time and place of the ship ARA San Juan was last seen. The Navy said the cause of the explosion may be related to issues about the battery that the captain has mentioned.